In June, 2016 the former staff member of Paton Welding Institute published in Jerusalem a new book «Welding of Metals: Classification, Brief History, Development». It gives a lot of information about metal welding processes, including ones not listed in American and European normative documents which the author tries to match to each other. For the purpose of international harmonization, a preliminary attempt was made to provide a unified classification of about 300 welding methods based on the abbreviations that are similar to ones adopted in the American Welding Society. 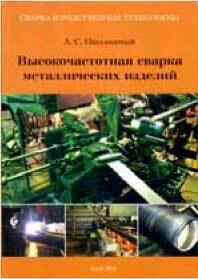 At the same time the book author tried to create the impartial review of historical metal welding developments against a background of general sciences evolution and progress of adjacent processes. Some comparative, economic and other considerations are given too together with a rich illustrative material and large number of references. Deterministic Chaos in Nonlinear Circuits with Electric Arc. Kiev: In-t elektrosvarki im. E.O. Patona, 2008. – 178 s. Tverdiy pereplet, 140h200 mm. Kiev: In-t elektrosvarki im. E.O. Patona, 2008. – 624 s. Tverdiy pereplet, 165h240 mm. V knige osveshcheni osnovnie etapi zhizni, nauchnoy, nauchno-organizatsionnoy i obshchestvennoy deyatelnosti vidayushchegosya ukrainskogo uchenogo v oblasti svarki, metallurgii i tehnologii metallov, materialovedeniya, vidayushchegosya obshchestvennogo deyatelya i talantlivogo organizatora nauki, akademika Natsionalnoy akademii nauk Ukraini, Akademii nauk SSSR, Rossiyskoy akademii nauk, professora, zasluzhennogo deyatelya nauki i tehniki USSR, dvazhdi Geroya Sotsialisticheskogo Truda SSSR, Geroya Ukraini, uchastnika Velikoy Otechestvennoy voyni, likvidatora avarii na ChAES Borisa Evgenevicha Patona. Ukazatel pechatnih rabot znakomit chitatelya s nauchnimi trudami uchenogo. Dlya nauchnih rabotnikov i vseh, kto interesuetsya istoriey otechestvennoy nauki i tehnologii. Kiev: IES im. E. O. Patona NAN Ukraini, 2012. — 116 s.
Azot v zhidkih stalyah i shlakah. Pod red. akademika B. E. Patona. — Kiev: Nauk, dumka, 2012. — 142 s.
Glava 1. Azot v zhidkom zheleze i zhidkih visokoazotistih stalyah. Glava 2. Azot v rasplavah metallurgicheskih shlakov. Glava 3. Sovremennie tehnologicheskie priemi proizvodstva azotsoderzhashchih staley. Visokotemperaturna rentgenografiya fazovih peretvoren u metalevih materialah. Kiev: Mezhdunarodnaya assotsiatsiya «Svarka», 2012. — 224 s.
Tverdiy pereplet, 165x235 mm (ukr. yaz.). V monografii na osnove sistemnih issledovaniy izlozheni vpervie razrabotannie metodicheskie osnovi i rezultati issledovaniya osobennostey kinetiki fazovih prevrashcheniy v luchah visokotemperaturnoy rentgenografii metallicheskih materialov. Kinematograficheskie s’emki osushchestvleni na originalnih konstruktsiyah rentgenovskogo oborudovaniya. Pokazana dominiruyushchaya rol i znachenie izmeneniy himicheskogo sostava i fizicheskogo sostoyaniya fazovih sostavlyayushchih splavov vo vremya termicheskoy i himiko-termicheskoy obrabotki kak sredstva upravleniya ih strukturoy i svoystvami. (2000) Space: Technologies, Materials Science, Structures. Collection of scientific papers. 528 p. and 24 ins.p. The collection presents the results of investigations based on the data of the experiments conducted in various manned and unmanned space vehicles. A broad range of practical issues are considered related to operation and repair of vehicles in space, construction and mounting of extended large-sized structures, making permanent joints by welding and brazing, application of various coatings by thermal evaporation. Particular attention is given to development of the hardware and instrumentation designed for operation in the severe space environment. "Induktsionniy nagrev dlya svarki i rodstvennih tehnologiy"
Kiev: In-t elektrosvarki im. E.O.Patona, 2005. - 140 s. 145h200 mm, myagkiy pereplet. V knige izlozhena teoriya protsessov, proishodyashchih pri induktsionnom nagreve metallov i v sisteme induktor-nagrevaemoe telo, osveshcheni voprosi, voznikayushchie pri tehnicheskoy realizatsii sistem etogo klassa. Poluchila razvitie teoriya obratnih zadach elektromagnitnogo polya i induktora v prilozhenii k problemam svarki i rodstvennih tehnologiy putem primeneniya impedansnih granichnih usloviy, opredelennih cherez udelnuyu moshchnost ili temperaturu na poverhnosti nagrevaemih tel. Eto pozvolyaet neposredstvenno proektirovat tehnologicheskoe oborudovanie ishodya iz pokazateley tehnologicheskogo protsessa. Izlozheni nekotorie novie metodi postroeniya elektricheskih shem zameshcheniya slozhnih mnogoobmotochnih induktsionnih ustroystv tehnologicheskogo naznacheniya i rascheta ih parametrov.